8.4 Mouse does not move in menu, inventory, etc. SecuROM 4 DRM disc check. Patch 1.2 uses SecuROM 5 DRM. Includes: Manual, 2 wallpapers, soundtrack, developer's commentary, 2 avatars, and 24 artworks. The v1.2 Patch updates North American retail versions to the latest version. Digital distribution and European retail versions already have this patch. 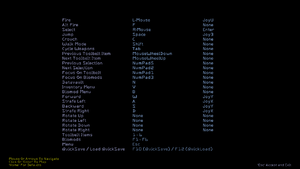 Full version includes John P's Deus Ex Unified Texture Pack as option during installation. 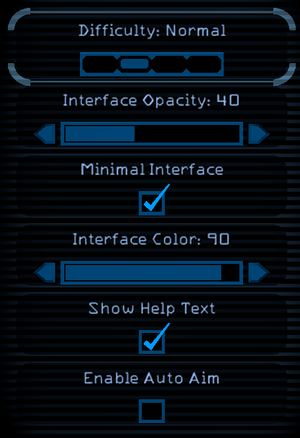 VisibleTweaker.exe offers a way to toggle on/off certain parts of the mod. John P's Deus Ex Unified Texture Pack improves textures and models for most of the game's assets and is a compilation of a variety of mods into a single installer. 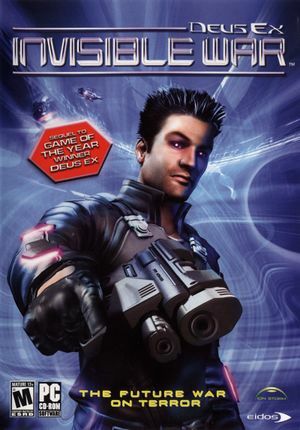 The GOG.com version of Invisible War is treated as the UK version. The Unified Texture Pack's installer will need to be set to UK to work. Some buttons/axes may not be recognised. 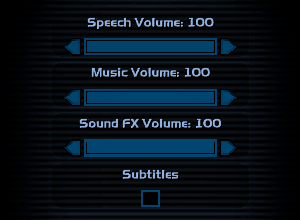 Italian language is only available for the retail version. Invisible War temporarily shows the desktop or a black screen prior to the loading screen. The game still works despite this. Perform the following steps while the game is running. Make sure the "Details" tab is visible and activate it. Find the "DX2Main.exe" executable, right click it, and select "Analyze wait chain." In the window that appears, there will be the DX2Main.exe as well as other program(s) that cause(s) the game to hang. Close those programs and the game will continue normally. SetPoint software can cause the game to hang while loading stages. Before the game is started. The game will refuse to run when installed on a drive which is managed as a storage space on Windows 8 and later. Mouse does not move in menu, inventory, etc. Windows 10 (and earlier?) desktop scaling prevents mouse from moving. ↑ 1.0 1.1 File/folder structure within this directory reflects the path(s) listed for Windows and/or Steam game data (use Wine regedit to access Windows registry paths). Games with Steam Cloud support may store data in ~/.steam/steam/userdata/<user-id>/6920/ in addition to or instead of this directory. The app ID (6920) may differ in some cases. Treat backslashes as forward slashes. See the glossary page for details.